It’s a big decision to hire a business consultant. It’s scary asking someone to come in and critique your business. Not to mention, it can be expensive. I hired my first business consultant back in the early days of my career and I still remember how anxious I was about finding the right person and whether it was worth the money. Twenty-five years later, with a couple of businesses under my belt, I can say it was well worth the time and money! So how do you get started? The first thing to do would be to revisit your business and career goals. Why did you get into this in the first place, and where do you want to be in 10 years? Then make a list of the things you think are holding you back. Be honest with yourself. It may be as broad as, “ I’m just not sure what my next steps are.” Or, “I seem to be working harder and making less money every year!” Whatever the case, identify the ideas or issues you’d like a consultant to help you with. Keep in mind that there are many different types of consultants. 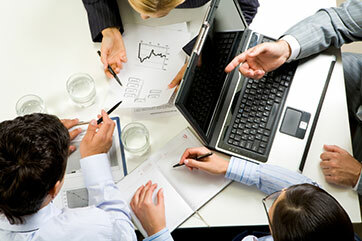 There are business consultants, marketing and sales consultants, HR consultants and operations consultants, to name a few. My recommendation would be to hire a consultant who not only has expertise in your particular area of concern, but also in the landscape industry. His or her learning curve can be greatly reduced if he or she already understands our industry-specific issues. In the landscape industry, it also may make sense to look for a consultant who has had some real-world experience running a landscape business. In addition, the National Association of Landscape Professionals (NALP) is a great resource for finding the right type of landscape business consultant. Once you’ve identified a few candidates, reach out to them via email and let them know what you’re looking for. Tell them a little about yourself and set up some time for a phone interview. During the interview tell them specifically what you’re struggling with and ask them to give you a brief resume on their background and areas of expertise. Ask them to share with you their approach to help you understand how they work. A clear explanation of how they do business. Ask them for a few references from companies that are similar to yours in size and or scope. A good consultant will typically want to know as much as he can about you and your business prior to showing up in your office. He’ll probably give you a list of items to send to them in advance, including a copy of the last three years of financials (balance sheet and profit and loss statement), a current organizational chart, a breakdown of your operational processes and an idea of your current problems and future goals. Based on the information, he may call to clear up some questions prior to visiting with you. Based on your pre-work, the consultant should send you a specific agenda for the time he’ll be spending with you. This agenda could include time slots, topics to discuss and/or job sites to visit and members of your team to be involved. Notify your team that a consultant will be visiting with the company. Explain that he or she is here to help the company improve, which will be good for the entire team. Let them know the consultant may want to interview them alone to understand their perspectives of the company. In fact, I would suggest that you have the consultant interview your key staff members alone to give them a chance to express their own opinions and concerns in a safe environment. Prepare yourself to be honest and open with the consultant. Failing to disclose problems or issues would be like visiting the doctor and allowing them to treat you without understanding the root problem. Don’t be embarrassed about the state of your business or your business experience. They have probably seen worse. One thing to know is your consultant wants to make a difference in the success of your business. He is very interested in understanding you and your business as quickly as possible, so he can begin to help you solve problems and move forward. He is aware of your uneasiness and about the sacrifice you and your team are making in terms of time and money. Generally, this first visit is a discovery phase for the consultant. It’s a chance to get to know you, continue to understand your business and assess your team. Based on his findings, he will likely prepare a report that will pinpoint the opportunities and threats that you’re facing and will outline the most important steps you’ll need to take to move forward. In addition, many times the consultant can offer you some great advice about best practices and documented processes that you can begin to implement immediately to improve your business. If your consultant will be traveling from out of town, it’s probably better to spend a couple of days together to give him time to get to know you and to leverage the travel costs. Finally, based on the next steps he recommends, the consultant will offer you an engagement he feels will best help you and your team move forward and accomplish your business and life dreams. Qualify the consultant by skill set and check references. Prepare yourself and your team for his visit by doing the pre-work and opening your minds. Be transparent with the consultant to allow him to understand your business thoroughly. Allow the consultant access to one-on-one time with your key team members and encourage them to speak freely. Review the consultant’s recommendations with an open mind and review with your team. Set a plan in place with your key team members to begin to implement the consultant’s recommendations. Don’t kid yourself, change is tough! Seriously consider engaging your consultant for an extended time period based on his recommendations. The return on time and dollars invested can be life changing. It was for me.